Some of food service applications want a cup that has handle on its body. 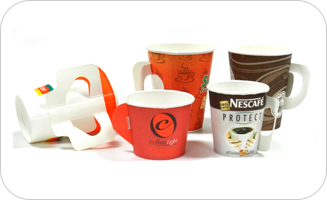 With handle, people can drink hot beverage without any inconvenience. The APH-150 applies handles to cups range from 3.5oz to 12oz, specially designed to cut down the cost of hot coffee cups. Up to 120 PE coated paperboard can be applied per minute using the hot air sealing station.